When I was little, I read a LOT of Enid Blyton’s stories. While many of her characters and books are well-known, there’s another that has stayed in my mind. I’m telling it from memory, so please forgive any errors in The Little Sugar Mouse. Each night, after you’ve gone to sleep, the toys come out to play. You may notice it in the morning: a ball in the middle of the rug, a doll wearing a different dress. The kind of things you’ll overlook and forgive with mistaken memory. There are many activities the toys like doing. Some nights they’ll read their favorite stories. Other nights it’ll be tea party time. Often they play hide and go seek. But the one thing the toys love more than any other is when it rains. They get to dress in their Mackintoshes and rain boots and sneak down the stairs and out the door. Well, all the toys did except the little sugar mouse. Every time the toys excitedly played in the rain, the little sugar mouse was left in the playroom, alone. This made the little sugar mouse sad. He got to play in all the other games, just not the rain. The doll said it was because he didn’t have a Mackintosh or four tiny rain boots for his four tiny feet. While that was true, it didn’t make the little sugar mouse feel any better. One night after the toys had dressed for the rain and snuck out the front door, the little sugar mouse decided he would play in the rain too. So the little sugar mouse scurried out the door and down the stairs, along the hall, and out the front door to find his friends. When the toys returned from their rainy fun, they were surprised to find the playroom empty. They called and looked for the little sugar mouse but he was nowhere to be found. So, they hung up their Mackintoshes and put away their rain boots and set themselves ready for the children in the day. The little sugar mouse must be hiding and sulking. During the day, they still didn’t see the little sugar mouse, but when the children took them for a walk outside in the afternoon, they saw a little string tail lying alone on the ground. I’ve called people little sugar mice many times. It’s my teasing insult when someone doesn’t want to go in the rain. Last weekend I mentally called the President a little sugar mouse for missing a memorial because it was raining (the simplification is unfair, but partially correct). It got me thinking more about the story. I wasn’t quite using it correctly for people in the rain, but perhaps accurately for the President. 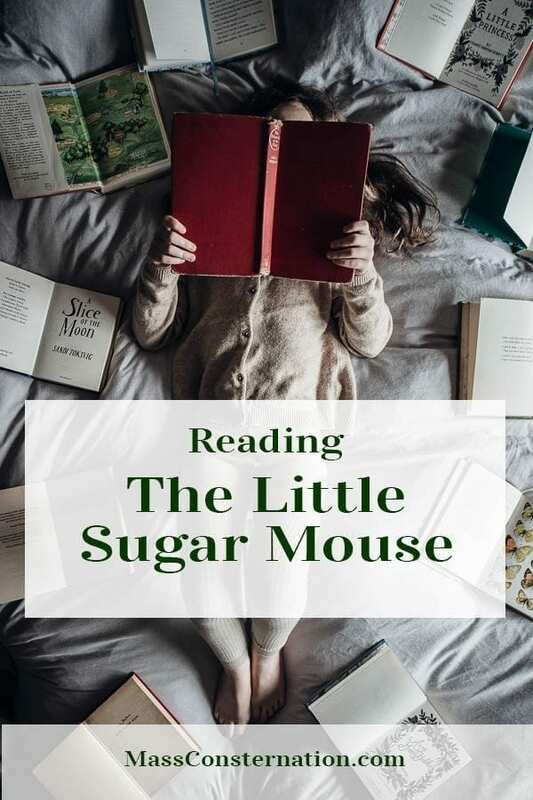 The Little Sugar Mouse is a story of listening to your more knowledgeable advisors, and it’s also a story of why you should be knowledgeable yourself. If the little sugar mouse knew what happens to sugar in the rain, maybe he would still be here today. This looks really sweet. If I ever have grandchildren, I’ll keep it in mind. Enid Blyton has many books I recall as being sweet. Probably worth an adult read first though. I can’t promise they aged well. I’m excited by Vox but it arrived late so I keep having to push it down my TBR. It’s my next print book. I usually concurrently read an ebook, a print, and either an audiobook or a classic with the serial app.